Explanation: A bevy of black holes and neutron stars shine as bright, point-like sources against bubbles of million degree gas in this false-color x-ray image from the orbiting Chandra Observatory. The striking picture shows the central regions of two galaxies, NGC 4038 and NGC 4039, locked in a titanic collision some 60 million light-years distant in the constellation Corvus. In visible light images, long, luminous, tendril-like structures emanating from the wreckage lend the pair their popular moniker, the Antennae Galaxies. Galactic collisions are now thought to be fairly common, but when they happen individual stars rarely collide. Instead gas and dust clouds merge and compress, triggering furious bursts of massive star formation with thousands of resulting supernovae. The exploding stars litter the scene with bubbles of shocked hot gas and collapsed stellar cores. 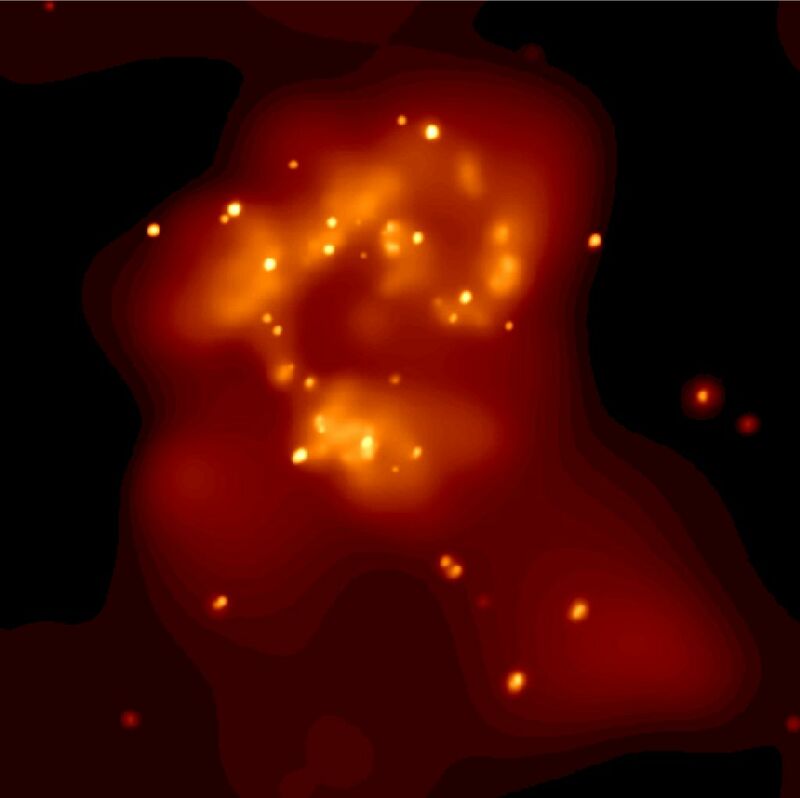 Transfixed by this cosmic accident astronomers watch and are beginning to appreciate the collision-driven evolution of galaxies, not unlike our own.